As Gulf of Aden is crowded with multinational warships and as Danish Warship Absalon, Indian Navy Ship Tabar, HMS Cumberland show no mercy to Somali pirates, it seems that Somali pirates are shifting their operation to Kenyan coast. This is confirmed by the fact that Very Large Crude Carrier (VLCC) Sirius Star was hijacked on November 16 by Somali pirates off Kenyan coast. The fully laden Sirius Star, VLCC belonging to Dubai-based Vela International Marine Ltd., was seized by pirates approximately 420 nautical miles southeast of Mombasa, Kenya. The VLCC is now believed to be at anchor off the coast of Somalia. All 25 crew members on board (2 British, 2 Polish, 1 Croatian, 1 Saudi and 19 Philippines nationals) are believed to be safe. The vessel is 332 metres long and is larger than the size of an aircraft carrier. 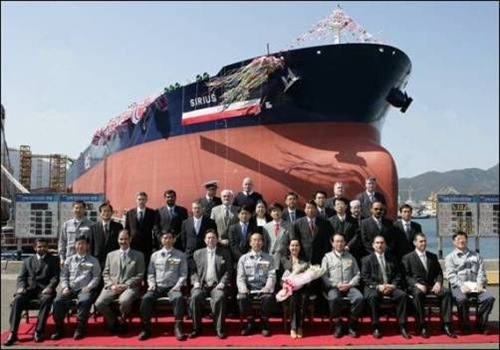 The vessel can carry about 2 million barrels of oil and the estimated value of oil cargo onboard is USD 100 million. The Sirius Star is built to the latest maritime regulations by Daewoo Shipbuilding and Marine Engineering Co. Ltd., Korea. The vessel joined Vela International Marine Ltd., fleet in March this year. Here is a video clip of the piracy news report of VLCC Sirius Star. Vela response teams have been established and are working to ensure the safe release of the crew members and the vessel. Read more from Vela International Marine Ltd, U.S Navy and for more photographs of VLCC Sirius Star, log on to China View. Vela International, operators of the Sirius Star, told the BBC that no demands has come from the pirates so far. Read more from BBC News. The pirates are asking $25 million ransom for the release of the Sirius Star and its crew within the next 10 days. Here is a photograph from U.S Navy of VLCC Sirius Star at anchorage near Harardhere, Somalia as on November 19. Also, Saudi Arabian authorities are currently not considering using force to free Sirius Star from Somali pirates, but have refused to rule out the option. Read more from RIA Novosti. 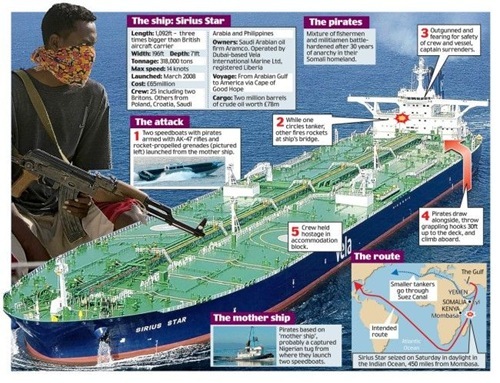 Also here is a graphics on Sirius Star hijacking from Mail Online. Read more about £65million worth Sirius Star hijacking from Mail Online. With an element of surprise, Somali pirates took only 16 minutes from boarding to seizing control of VLCC Sirius Star off the Kenyan coast. Read more from Express India. Somali pirate says “I hope the owner of the tanker is wise enough and won’t allow any military option because that would be disastrous for everybody”. Read more from Sky News. 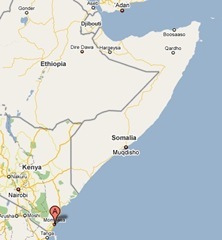 A group of Islamic fighters of Somalia have come to Harardhere where Sirius Star is anchored. They have come either to fight with Somali pirates to release the ship as they have hijacked a ship from Islamic country. Or they want to take a share from the ransom payment expected to be collected by the pirates. Read more from Sky News and Yahoo Finance. Further, general counsel for Oil Companies International Marine Forum (OCIMF) has warned that sinking, running aground or setting on fire — these are all risks that are present with the hijacked VLCC Sirius Star. Read more from Sustainable Shipping News. Somali pirates during negotiations have reduced the ransom amount to $12 million from $25 million. The amount may get reduced further. Read more from RIA Novosti. Also there are reports saying that Somali pirates have moved VLCC Sirius Star to an unknown location from Harardhere due to threats coming from Islamic fighters of Somalia. Read more from China View. Now VLCC Sirius Star is about 30 miles (50 kilometers) off the coast of the coastal village of Harardhere. 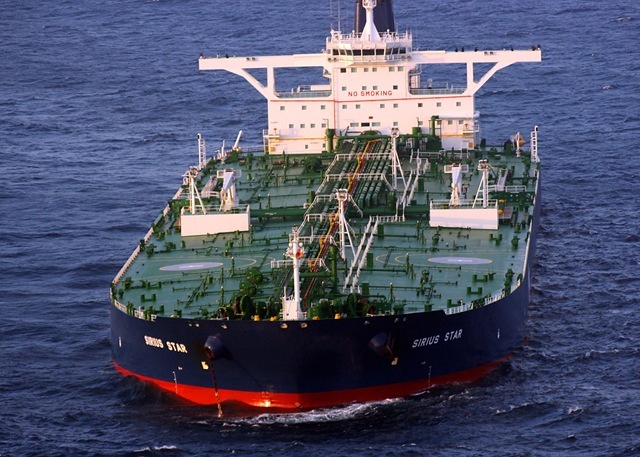 The Chief Engineer of the tanker has told ITV News through telephone that pirates are no problem whatsoever and the crew had no mistreatment or anything by the pirates. Read more from Times Online. The Saudi VLCC Sirius Star, seized by Somali pirates, is expected to be released within the next two days as per the Saudi Arabian ambassador to Kenya. Read more from RIA Novosti. Negotiators on behalf of the owners of the Sirius Star have agreed to pay the ransom and the supertanker with 25 crewmembers is expected to be released within 72 hours of the ransom being received. Read more from RIA Novosti. Somali pirates have released VLCC Sirius Star on January 09, after receiving $3 million ransom payment. Read more from Guardian and Sky News.